Wild guinea pigs, just as cute as their domesticated counterparts, call the mountains and grasslands of Brazil, Uruguay, Argentina, and Peru home. Guinea pigs, also known as cavies, can live from one to four years. They come in a variety of colors, weighing in at one to four pounds and being around eight inches long. Wild guinea pigs enjoy freedom to roam and run in their mountainous or grassy homelands, but must look out for a variety of predators. Wild guinea pigs enjoy vegetarian diets. They enjoy feasting on leaves, hay, grass, and even flowers. Clovers are a special treat to the guinea pig's palate. Guinea pigs enjoy burrowing themselves underground and co-exist in family groups. Their underground burrowing habits are a good explanation as to why pet guinea pigs enjoy running around and playing in makeshift tunnels and hideaways in their cages. Wild guinea pigs are awake and active during dawn and dusk. Being a small animal, guinea pigs face an array of challenges being in the wild. They are the prey of larger animals including wild cats, owls, coyotes, and wolves. Snakes may also target guinea pigs for a meal. Humans are yet another threat to wild guinea pigs, as they may hunt them or take them out of their native habitats to sell or breed them. Folk doctors in the Andes mountains believe that guinea pigs are helpful little assistants in detecting the source of a disease or illness in a person's body by squealing at the source. Wild guinea pigs communicate with one another by making sounds and using body language. They may make grunting, gurgling, and rumbling noises to communicate with one another. A growl or grunt is actually a friendly welcome to fellow guinea pigs. 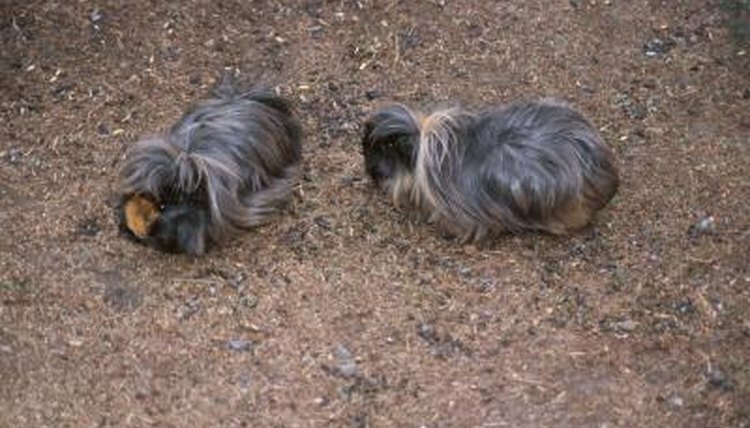 Guinea pigs may also show signs of submission to larger and stronger guinea pigs by lowering their head and making a rumbling noise. Summertime is the time of love for guinea pigs. After a 60-70 day period of gestation, a female cavy will give birth to a litter of one to four guinea pig babies. At birth, guinea pigs are already covered in fur and look basically like a small version of their moms and dads. Guinea pig young don't stay with their moms for very long though, as they can be completely independent at just five days old.